For the past week or so, there was a box of fresh nectarines sitting on my kitchen counter. Every morning I passed by them, I thought about making a pie or galette. Eventually, I decided against this, however, because I am home alone during the day, each day this week. Nothing is worse than being home alone, bored, with pie in the refrigerator. So I decided to make a chutney. That way, it can be bottled and shared with my lucky friends. Chutneys are very much a part of Indo-Trinidadian cuisine. It is often served on the side with almost everything: curried meats, vegetables, and even street foods and non- Indian foods. The most popular ones are mango, cucumber, and, my favorite, coconut. 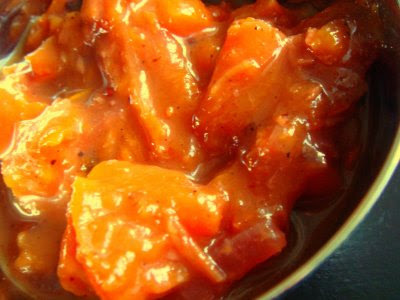 This recipe is a variation of mango chutney. The spices used here are easy to find in your neighborhood grocery store, with the exception, maybe, for amchar masala which can be found at West Indian grocery stores. If you are adventurous, you can make you own. I found a simple recipe at GourmetSleuth. This blend of masala is unique to Trinidad and Tobago. The history behind it is quite interesting actually. In 1845, after the abolition of slavery in the Caribbean, workers were still needed on the sugar cane plantations. Enter: East Indian indentured laborers. They brought with them much of their Indian culture: religion, food, dance, dress, language. Indentureship ideally should have lasted for five years but many chose to remain on the islands instead of returning to India, for different reasons. Some feared not regaining their social status upon their return, others had nothing to return to (the reason they left in the first place) and yet others contemplated renewing their indentureship to earn more money and return at a later date, only that date was postponed so many times until all thoughts of returning faded. Much to the benefit of our island culture. Amchar masala was one of the many spices brought from India. Each cook has his/her own uses for this particular blend of spices. In my family, we use it mostly in relishes and chutneys, and to season meats. It is quite versatile so if you do mange to get your hands on a package or make your own, feel free to experiment. 1. In a stock pot over medium heat, add vegetable oil and fenugreek and mustard seeds. Once seeds begin to pop, add minced garlic, sliced onions, cloves, cinnamon sticks, and scotch bonnet. Cook for 15 to 20 minutes until onions have softened, stirring occasionally. 2. Meanwhile in a large bowl, dissolve sugar in water, vinegar and white wine. Set aside. 3. Once onions have softened, stir in nectarines, masala and coriander. Add liquid mixture, stir, cover and bring to a boil. Reduce heat to low, and cook for approximately 1 hour until chutney thickens and nearly all the liquid has evaporated. 4. Pour into sterilized jars and seal tightly. Thanks ttfn300! Amazing that I even retained so much from high school history. Congratulations on your FFF Award. Well deserved. You have a mighty fine blog here.